Elegance has a new face in this stunning design by luxury fashion house Luisa Viola. Striking with intricate lace detailing on the hem and cuffs, this jersey top is all the feminine touch you need to complete your look in style. 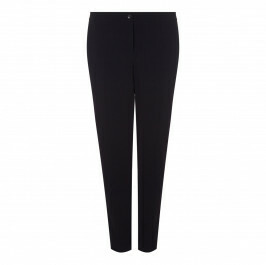 Ideal for wearing with tailored trousers and heels. Black jersey top with lace detail on hem and cuffs. 96% Viscose, 4% Elastane. Fabric 2: 88% Polyamide, 12% Elastane. Delicate Machine Wash or Dry Clean.